Abseiling Travel Insurance, we compare policies to cover you on against loss or damage for your trip. Abseiling, also known as rappelling, is climbing down a rock face sitting back and relying totally on a rope and harness to get you safely to the bottom. Abseiling is often used as a charity event and can be a good way of fund raising. There are many different courses and activity days provided for abseiling, however, it is important to ensure that you are fully covered by your insurance to participate, as that is the last thing you want to be worried about when abseiling down a rock face. Unless you’re a professional at abseiling, abseiling is normally completed with a professional instructor. When on holiday it is essential that all activities you are likely to participate in are covered by your insurance policy and not just the abseiling so always remember to read the terms and conditions carefully. Don’t worry if you have just taken out insurance and realise it doesn’t fully cover you. You have a 14 day cooling off period with any insurance cover if you aren’t happy. It is good to look at any holiday insurance you already have in detail as, if abseiling isn’t covered, you can always look at buying a separate single trip abseiling policy or even one which will just cover abseiling for a single day. The policies below offer abseiling cover at the time of writing but please do check the policy documents carefully to ensure they fully meet your requirements. 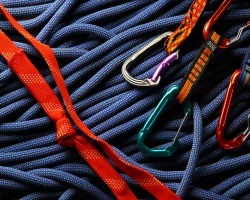 JS Travel Insurance are experts in finding cover for specialist areas, especially in adventure sports such as abseiling. JS Travel Insurance offer abseiling insurance as long as you ensure the activity is adequately supervised and that the appropriate safety equipment is used at all times. An online quote for their insurance can be obtained using the form at the bottom of their page about abseiling insurance. Don’t worry if you have a pre-existing medical condition, this doesn’t mean you won’t be able to get adequate travel insurance as JS specialise in this sort of cover as well. SportsCover Direct offer both single trip and annual multi trip cover for world-wide holidays which can include cover for abseiling. SportsCover Direct can also provide an ‘ActivityTopUp’, meaning that their cover can be combined with other companies' standard annual travel insurance policy. Using the ‘ActivityTopUp’ means there is no need to duplicate cover with other insurance policies for the sake of an activity such as abseiling. This can be useful when back-packing and participating in activities you hadn’t planned on at the start of your trip. Flexicover offer abseiling cover within their travel insurance at no additional cost as long as it is within organiser’s guidelines, the recommended safety equipment is used and the local laws are being adhered to. Abseiling at all levels poses many risks for accidents and injuries, and it is essential that, if you are a beginner, a qualified professional has organised and is supervising the event. Injuries from abseiling can include: falling rock injuries, collisions with trees or rocks, failure of equipment, anxiety or stress, rope burn and injuries from another person swinging. It is also important to understand the risk of avalanche in the area in which you wish to abseil down, this can help to prevent the risk of injury. Another important consideration is the condition of the equipment you are using. You should always check that all equipment is in excellent condition and that all the equipment needed is present before you start your decent. Some of the equipment needed is a climbing harness, climbing ropes, descender or rappel, belay device, helmet, gloves, knee and elbow pads, climbing shoes and a rope bag. Despite the seemingly large number of risks, abseiling is generally considered a safe sport for those of all ages.